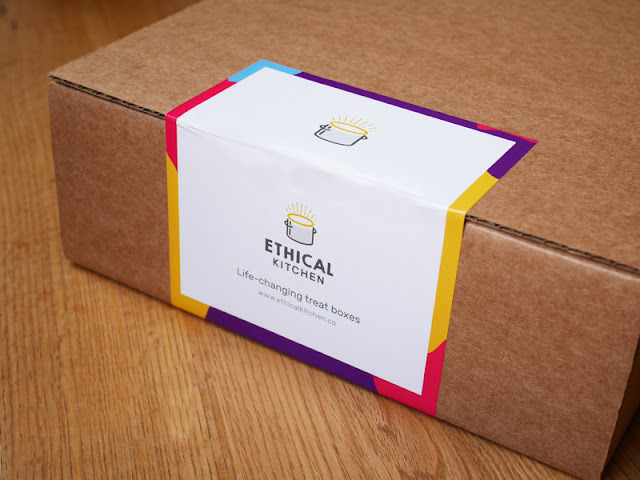 Ethical Kitchen is an alternative take on the booming subscription box service market. 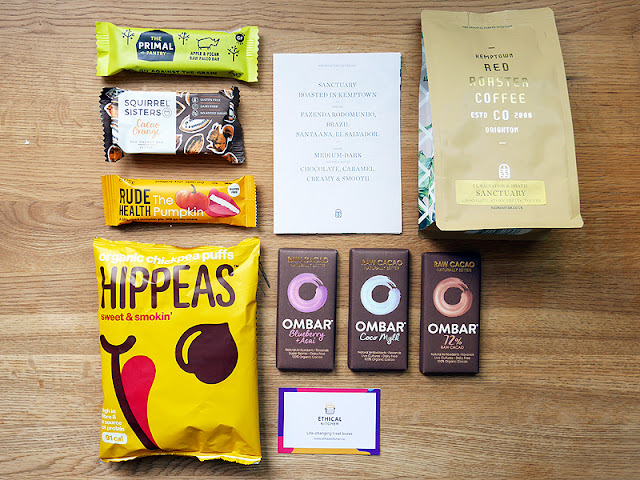 Brighton-based and with a social conscience, they are launching with a series of coffee, chocolate and healthy snack boxes, all curated from brands that share their values. The Ethical Warrior box contains a bag of freshly roasted speciality coffee, bars of premium chocolate and healthy snacks for £21.15 per month (inc delivery). 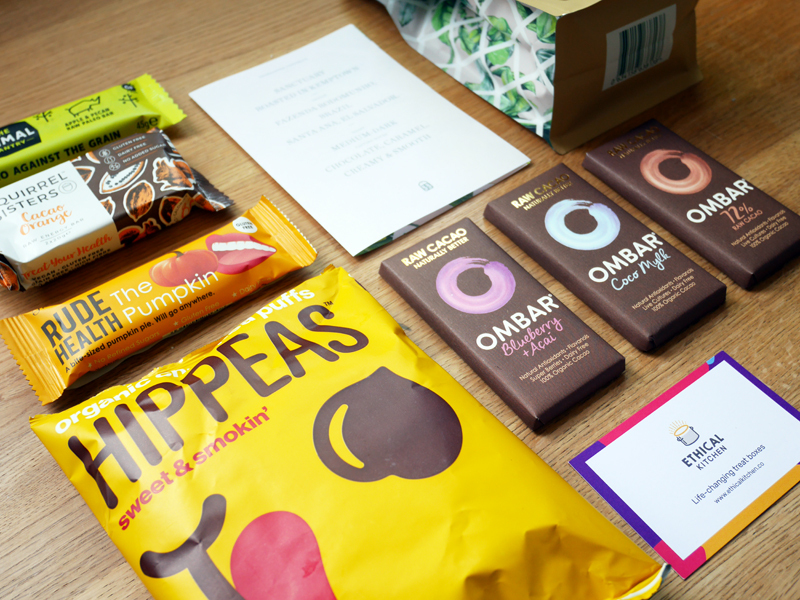 Or The Ethical Snacker box contains premium chocolate and healthy snacks / snack bars for £11.25 per month (inc delivery). I tried out the Warrior box where it sat, very welcome, on my work desk, primed for my mid afternoon energy slump. So first to be consumed, alarmingly quickly, were the snacks. Very cutely packaged was the Squirrel Sisters (I love a squirrel, me) Cacao Orange Raw Energy Bar energy bar in a classic, zingy flavour combination. Really delicious, slightly squidgy and lovely texture. The pack had two bars so, with great restraint, lasted me a couple of days. 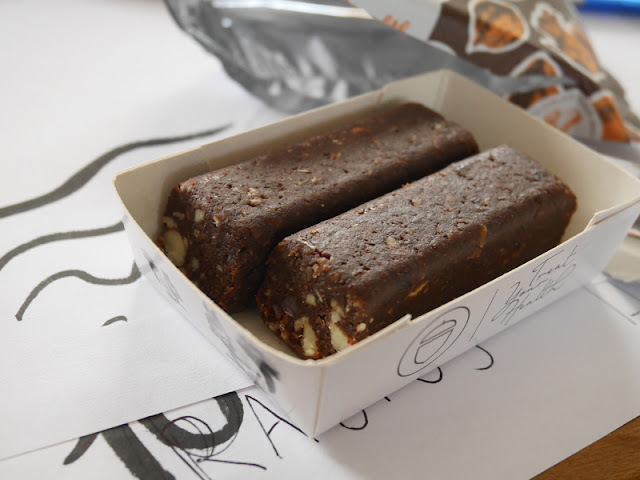 I love these types of raw, natural bars - they satisfy a sweet treat urge but do it with a nutritious advantage. Much in the same style is the Primal Pantry Apple and Pecan Paleo bar. Grain/gluten/sugar/daily free, natural and cold-pressed in the UK, it was again really enjoyable and surprisingly indulgent for a bar simply made with dry fruit, nuts, spices and almond oil. I really like the Rude Health brand anyway (best Almond milk on the market and kickass branding), their pumpkin bar was a nice flavour alternative that works well with those base ingredients. Surprisingly delicious were the Hippeas Sweet and Smokin' Organic Chickpea puffs. Crisps are my weakness so much so, I've banned them from the house but these are very saintly plus they support Farm Africa, a charity working with farmers in Sub-Saharan Africa to grow their communities and themselves out of poverty. The guest coffee was Brighton's Redroaster Sanctuary Blend. As you've probably worked out, I'm a bit of a fan of the stylish cafe and love the idea that the roastery, right here in Kemptown is still one of the UK’s first specialist coffee houses and only organic certified roastery in the South. You can have the coffee either as beans or ground. I tend to use a classic Bialetti Moka pot (die-hard Italian I am) and the grind was a bit too coarse to filter through properly, so will probably stick the rest in a cafetiere. Still it's a lively, slightly fruity blend and really smooth. The packaging is lush too. Finally, the bars of chocolate were the biggest surprise. I'd seen the Ombar brand in the local health food shop but just thought it was yet another raw chocolate bar. But all three were SO ENJOYABLE (yes, in CAPS) - so much more flavour than your typical chocolate and much more refined than expected - I've had some pretty awful raw chocolate experiences! Plus, they are full of live cultures and impressively healthy ingredients - no refined sugar or dairy. The Blueberry and Acai had serious tang, Coco Mylk was smooth and creamy and the 72% dark showcased the core product at its best. I enjoyed them so much I'll 100% purchase again. As well as the social credentials, it's a great way to be exposed to new brands and products. Subscription boxes are a luxury but there's no denying they're a fun one and an affordable treat to yourself or awesome present. If you are a lovely boss, you can also order office boxes for your staff to sharpen up their efficiency post 3pm. The box selections will change monthly and are beautifully designed (one of the founders is a designer - natch). But their differentiator is clearly their values. 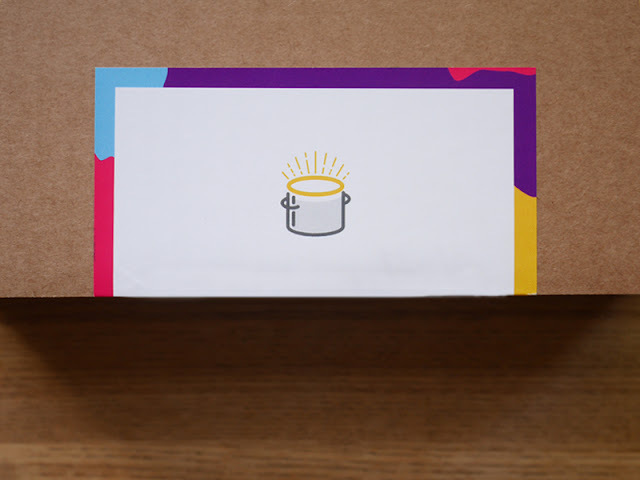 As well as supporting brands that already do good work, 50p from every box will go to community projects run by their charity partners. Their first partner is Point Foundation, who do amazing work in Rwanda, helping disabled and special needs children to get an education they otherwise wouldn't. Deliveries within the Brighton area will, where possible, be made using a local carbon-neutral bike courier called Recharge Cargo. Gift subscriptions are available as one, three or six month packages. The first box will be beautifully gift-wrapped, contain a personal message and a discount code to use in the Ethical Kitchen shop which has some lovely products. So ideal for that gift idea. More over on the Ethical Kitchen website. I was sent a box for review. Words and thoughts, as always, my own.